Izzy “Adventure Kitty” Katzenbaum finally fulfills the promise of her name. It was bound to happen sooner rather than later. The story begins with the first thing we bought for Escape Velocity nine months ago. We’ve noticed a change in the little duffer. She is less enamored of shrubs and foliage on land, not that she gets many opportunities to try it out, but given the chance she’ll head right back to EV. We’d promised her a bit of a romp on terra firma but first we had to make sure that Deezel, our hosts’ cute dog, wasn’t around. Izzy isn’t partial to dogs and she’s quite nervous in new situations. Marce sent me back to EV for Izzy, then went into the house for Internet. Now, dear readers, I feel I should explain that our setup for the 10 foot dinghy ride from our hosts’ sport fishing boat to EV, tied to their outer pilings, is less than ideal. It involves clambering over their transom, untying our dink’s painter and pulling on the stern line which is attached to EV, until one can hop onto the sugar scoop steps. So far so good. Izzy was not as enthusiastic as we were for her to discover new horizons. 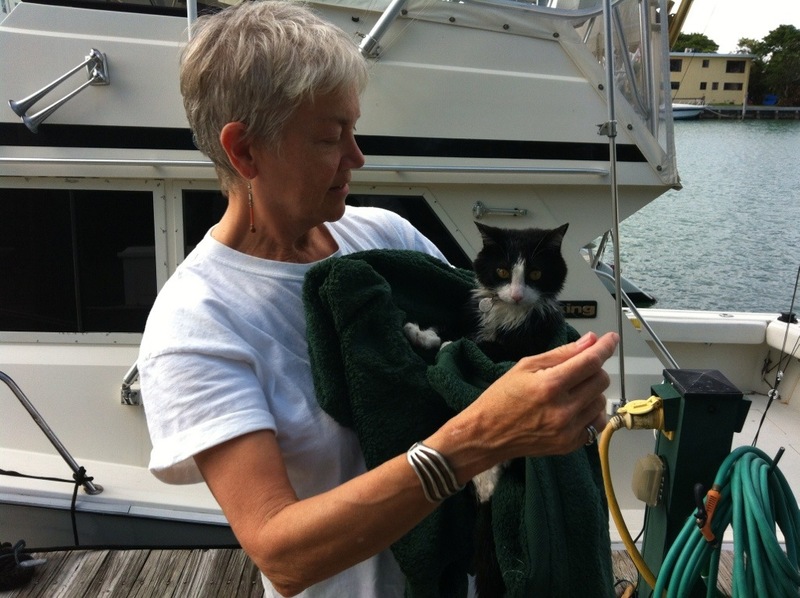 Based on her last few dinghy rides I eschewed her cat carrier deeming her an experienced yachtsman who would sit quietly in the bottom of the dink while I fiddled with the various lines and pulled us across the great divide. In hindsight this may have been a mistake. For extra insurance I clipped her leash on her collar. It was quite a balancing act, climbing over the dink’s oversized inflatable tubes while holding her and we ended up sitting down abruptly, but any landing you can walk away from is copacetic with me. I deployed Izzy at the bottom of the dink and started the ferrying process. Sometime while tying and untying the various lines, Izzy decided that she had seen enough new horizons and she wasn’t having any of it! In one desperate leap she was heading home. You know I’m convinced that she would have made it to EV if it weren’t for that leash. There was a surprisingly big splash for such a small cat. As she swam away from me, her little head bobbing with each stroke and her leash trailing behind her, I thought that could be the last thing I see of Izzy. I leaped into action, nixing a fleeting notion of diving in after her. That rarely turns out well. It was the “Izzy net” I was after. 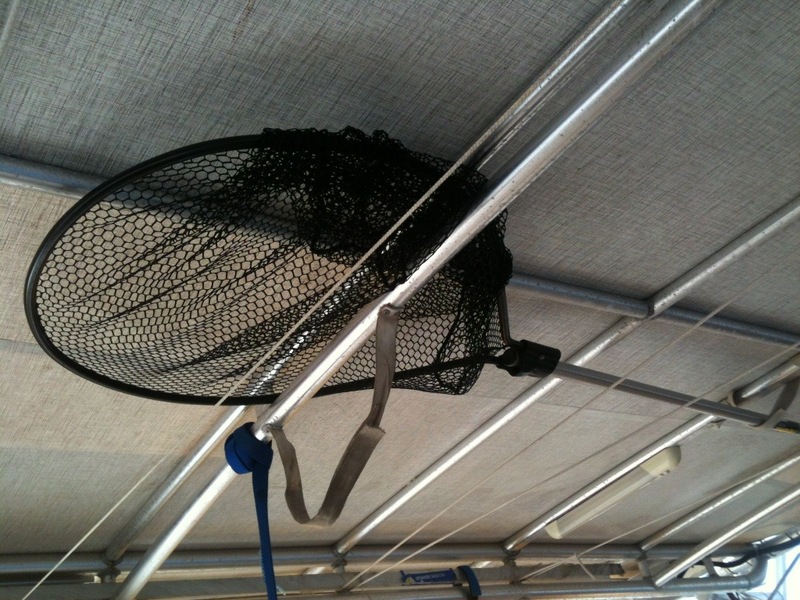 In my panic I had a rough time getting the net down off the roof. I ran along the side of the boat peering down into the water but I couldn’t see her. I was convinced that she must have gone under. As I was developing a plan B I noticed a dark object at the bottom of the front piling. It turned out to be Izzy clinging to the wooden piling near the bow, over 40 feet from where she went in. I was afraid that she wouldn’t let go of the post even if I was able to scoop her up with the net. After positioning the net under her I started to push her up the pole and she was so exhausted she just tumbled into the net, which was suddenly so heavy I was afraid it would snap. I deposited her on deck and wrapped her in a towel. She started to shake uncontrollably and I knew the only person that could comfort her was Marce. I stuffed her into a boat bag and whisked her into Marce’s arms as fast as I could. I guess it was only a matter of time but Izzy showed pluck, strength, and resourcefulness in dire circumstances. Of course her ordeal wasn’t over. We had to hose her down with fresh water to try get the saltwater off. She may never forgive me, two dunkings in one day, but she survived. Izzy “Adventure Kitty” Katzenbaum. Yeah that works.